We got up early this morning with the prospect of a moderately long drive ahead of us. 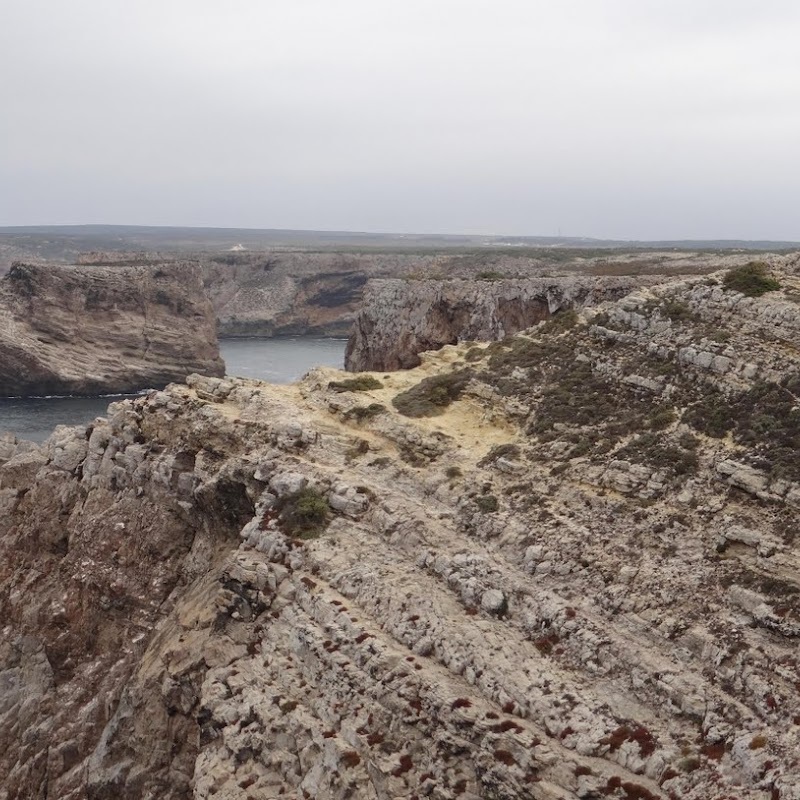 The drive in question would take us to the End of the World, which in this corner of the world means the far southwestern tip of the Iberian Peninsula at Sagres. Unlike below Land’s End it’s not actually the most southerly part of the peninsula. Southern Spain below Cadiz and Gibraltar is much further south. OK, so it’s the southwestern tip of mainland Portugal. But it’s not the most southerly part as (Faro is further south and it’s not the most westerly part as much of the coast between Setúbal and Leiria is further west. Let’s settle for it being the most sticky-out bit, and the bit that most looks like a goaty beard. It bears some similarity to Land’s End in that the part referred to as “The End of the World” (Cabo de São Vicente) is slightly north and west of the more southerly Ponta de Sagres, rather like Land’s End and the Lizard Point, but closer together. Back at the plot, it was about an hour drive from our apartment, including our first experience of the Portuguese toll motorway system. It’s great if you have the technology. You drive under some cameras, your number plate is captured by an ANPR system, and the car goes “bleep” to tell you that you just got captured. They also very handily tell you how much each section is going to cost you to drive on. It cost all of €3.20 to get to Sagres from Albufeira. As we were driving west the weather was getting increasingly cloudy, and when we arrived at our destination the sky was decidedly grey. It also wasn’t very warm, and as we hadn’t packed any clothing for cold weather we decided the best remedy was to get some hot coffee in the car park. Somehow we managed Izzy’s first injury of the day here too, when she tried to corner too sharply on some loose gravel and lost her footing, which resulted in two skinned knees and some crying. The two coffees came with a side order of wet wipes and plasters. The Cabo de São Vicente lighthouse would probably be classed as slightly disappointing and a failed opportunity if it were in England. It was free to enter but there was no gift shop, no cafe, and one (quite small) exhibit about the Portuguese Age of Discovery). The views from inside were quite good but because access to the actual lighthouse isn’t possible you can’t actually see directly out to sea. You can only see along the coastline in the northerly and easterly directions. So as there wasn’t very much in the lighthouse we came out again after about 20 minutes and made a short walk over some very rough terrain to find a geocache and to get a better angle for taking photos of the lighthouse. It was very rough terrain – exposed rough limestone blocks (although not an alvar). All jagged edges and knobbly bits. I was quite impressed that Izzy managed to walk across it without falling over at all. From here we drove back towards Sagres, making a brief stop at the ruined Fortaleza de Belixe to do a cache and have a quick mooch around. By now the weather was picking up, and buying a sunhat rather than a cardigan earlier was starting to look like a good choice. By the time we reached Fortaleza de Sagres the sun was fully out and it was warming up quite a lot. In unrelated news, the parking was rubbish. The fort charges an entry fee which gets cheaper if you take children. Not just “kids go free” kind of cheaper, but “take a child and get a free adult entry” cheaper. The two adults in front of us paid €6 for the two of them. We paid €3 for all 4 of us. You do the math, as they say in America. Once inside the fort we split up for a while. Izzy had managed to get a blister on her heel from some new shoes at some point so didn’t fancy walking the 500m or so out to the end of the promontory to do the Earthcache that was there, so Ami and me hot-footed it out there while Izzy and Kas explored the buildings of the fort in some detail. I think that worked for all four of us. After about 45 minutes at the fort the girls had had enough so we moved on to the Tonel Beach in Sagres to get some late lunch. We ended up staying on the beach until home time. The cafe we found was really good apart from not taking credit cards, so we ate reasonably well and had the obligatory ice cream before retiring to the beach for some plodging and general sunbathing. The sea was cold again but the beach itself was really nice – it was clean, the sand was soft and it wasn’t too busy. As this is the Atlantic Ocean there were also some fairly decent waves on it, despite this being around the leeward side of that big promontory that has the fort on it. Much mirth was to be had by running in and out of the waves. We stayed there until around 5:15 but then heard the call of home, so we packed up and jumped into the car. It took us a bit longer to get home but once we were there we had a quick clean up and headed round to JK’s (again) to have some dinner. On this evening they were really busy so the service took a while, but we wren’t too bothered and the food was really good again, once it arrived. The kids are starting to get the idea that “going out for dinner” doesn’t mean just going somewhere to eat as quickly as possible and then go home again. We also couldn’t figure out how to make the washing machine work, but I did manage to figure out how to make my “travelling” laptop talk to the apartment’s wi-fi, and hence I’ve been able to start typing some of these blog posts whilst still actually on the holiday. A busy day, and we’d all had enough when we got back home to bed.